The University of Cambridge (often Cambridge University), located in Cambridge, England, is the second-oldest university in the English-speaking world and has a reputation as one of the world's most prestigious universities. 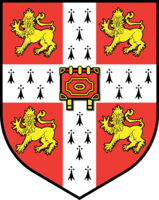 The University grew out of an association of scholars in the city of Cambridge that was formed, early records suggest, in 1209 by scholars leaving Oxford after a dispute with local townsfolk there. The universities of Oxford and Cambridge are often jointly referred to as Oxbridge. In addition to cultural and practical associations as a historic part of English society, the two universities also have a long history of rivalry with each other. In protest at the hanging, the University of Oxford went into voluntary suspension, and scholars migrated to a number of other locations, including the pre-existing school at Cambridge (Cambridge had been recorded as a “school” rather than university when John Grim held the office of Master there in 1201). These post-graduate researchers from Oxford started Cambridge’s life as a university in 1209. Cambridge’s status as a university is further confirmed by a decree in 1233 from Pope Gregory IX which awarded the ius non trahi extra (a form of legal protection) to the chancellor and universitas of scholars at Cambridge. 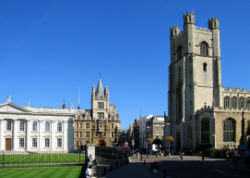 After Cambridge was described as a studium generale in a letter by Pope Nicholas IV in 1290, and confirmed as such in a bull by Pope John XXII in 1318, it became common for researchers from other European medieval universities to come and visit Cambridge to study or to give lecture courses. Cambridge’s colleges were originally an incidental feature of the system. No college is as old as the university itself. The colleges were endowed fellowships of scholars. There were also institutions without endowments, called hostels. The hostels were gradually absorbed by the colleges over the centuries, but they have left some indicators of their time, such as the name of Garrett Hostel Lane. Hugh Balsham, Bishop of Ely, founded Peterhouse in 1284, Cambridge’s first college. Many colleges were founded during the fourteenth and fifteenth centuries, but colleges continued to be established throughout the centuries to modern times, although there was a gap of 204 years between the founding of Sidney Sussex in 1596 and Downing in 1800. The most recent college established is Robinson, built in the late 1970s. In medieval times, colleges were founded so that their students would pray for the souls of the founders. For that reason they were often associated with chapels or abbeys. A change in the colleges’ focus occurred in 1536 with the dissolution of the monasteries. King Henry VIII ordered the university to disband its Faculty of Canon Law and to stop teaching “scholastic philosophy”. In response, colleges changed their curricula away from canon law and towards the classics, the Bible, and mathematics. 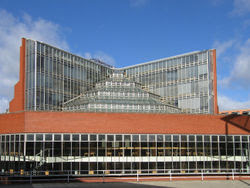 A 'School' in the University of Cambridge is a broad administrative grouping of related subjects, each covering a specified group of Faculties. Each has an elected supervisory body - The Council of the School - comprising representatives of the constituent Faculties and Departments in each School. Teaching and research in Cambridge is organised by Faculties. The Faculties have different organisational sub-structures which partly reflect their history and partly their operational needs, which may include a number of Departments and other institutions. In addition, a small number of bodies entitled Syndicates have responsibilities for teaching and research, exercising powers similar in effect to those of Faculty Boards. Examples are Cambridge Assessment, the University Press, and the University Library. The University of Cambridge has more Nobel Prize winners than any other institution. 82 affiliates of the University of Cambridge have won the Nobel Prize since 1904. Affiliates have won in every category, with 29 Nobel prizes in Physics, 23 in Medicine, 19 in Chemistry, seven in Economics, two in Literature and two in Peace. Trinity College has 31 Nobel Prize winners, the most of any college at Cambridge. Dorothy Hodgkin is the first (and only) woman from Cambridge to win a Nobel Prize, for her work on the structure of compounds used in fighting anaemia. In 1950, Bertrand Russell became the first person from Cambridge to win the Nobel Prize in Literature, for his 1946 work, 'A History of Western Philosophy'. Frederick Sanger, from St John's and fellow of King's, is one of only four individuals to win a Nobel Prize twice. He won the Nobel Prize in Chemistry in 1958 and 1980. In 1991, Harvard University created its own spoof of the Nobel Prize, called the 'Ig Nobel Prize'. Ten prizes are awarded each year for 'for achievements that make people laugh, and then make them think'. The University of Cambridge has had no winners. I’m a student from Bangladesh. I want to get admission in your University. I found Your University address from sromobazar.com .Can I apply from the site to you? Do you have any agent in Bangladesh? Unfortunately, one cannot apply from this site, as this site is not Cambridge's website. However, you can check out the University of Cambridge's site for more details on applications. Give it a shot!